There were puppets. There were pyrotechnics. And a house fell down. 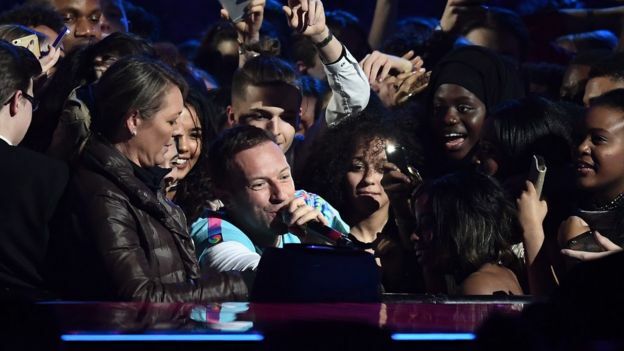 All in all, it was a pretty eventful Brit Awards. David Bowie won the biggest prizes, while The 1975 and Beyonce also took home trophies. But the winners are only half the story. Who surpassed themselves? Who embarrassed themselves? These were the real winners and losers at the O2 arena. 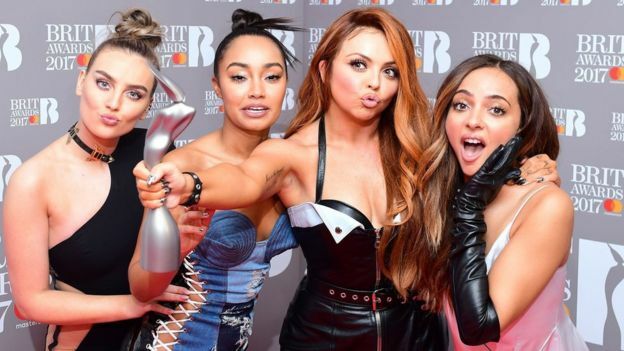 When Little Mix won best single, they took so long to find the podium that organisers had to play their intro music twice. “I’m sorry it took so long to get up here,” said a taken aback Perrie Edwards. 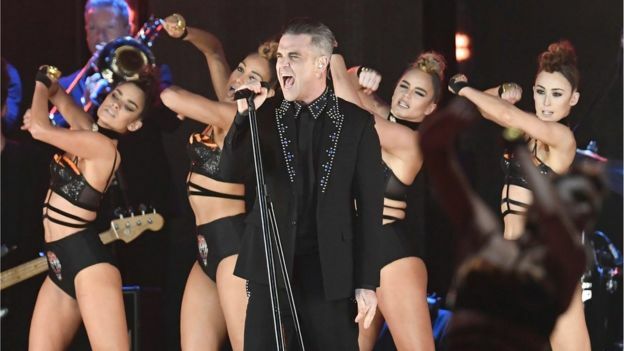 Katy Perry sang her new single surrounded by dancers dressed as white houses, while skeletal mannequins of Theresa May and Donald Trump stalked across the stage. 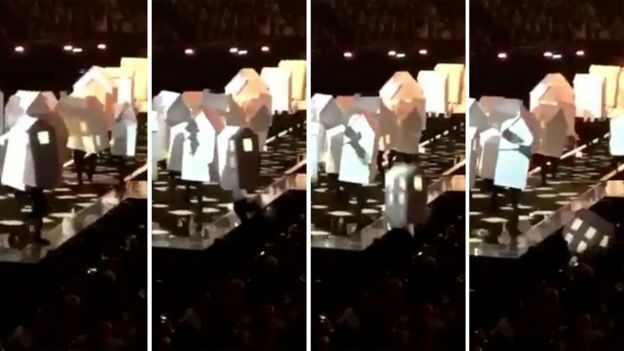 As the song reached its climax, one of the houses missed their footing and fell off the stage on to a spectator below. Yes, she brought the house down. 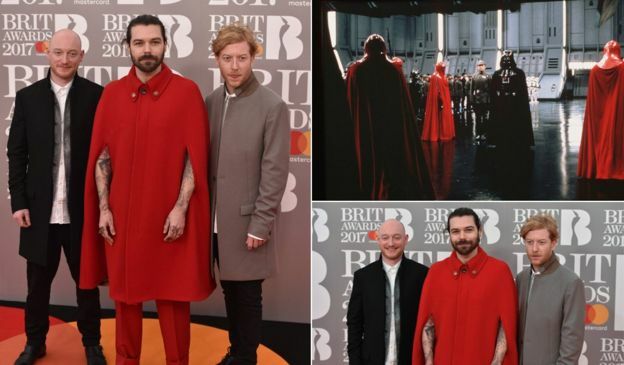 Simon Neil of Biffy Clyro arrived in a bright red cape that immediately made us think of the Emperor’s Royal Guards in Star Wars: Return Of The Jedi. “The Emperor’s Guards? I’ll take that,” he laughed. The winner, for the eighteenth consecutive year, was “any road vehicle”. An accident in the Blackwall tunnel left dozens of pop stars scrambling to get to the O2 arena on time. 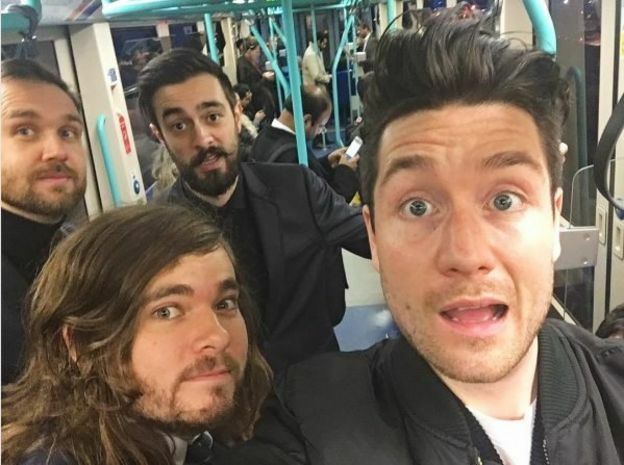 Bastille hopped on the tube while Charli XCX caught a cable car with her manager, who is petrified of heights. Holly Willoughby’s husband Dan used the delay to catch some extra sleep – representing all the working parents out there. Robbie, Robbie, Robbie. What were you thinking? When the Brits give you their highest honour, you turn up and play the hits. Here’s what we wanted: Let Me Entertain You. Rock DJ. No Regrets. Feel. Angels. Here’s what we got: Welcome to the Heavy Entertainment Show. I Love My Life. Mixed Signals. The three remaining members of Wham! appearing on stage to pay tribute to George Michael was tough to watch. 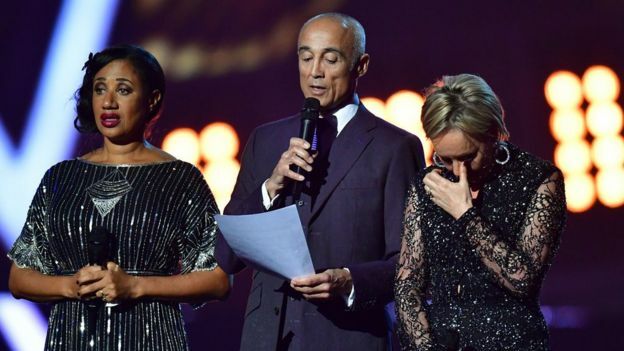 Pepsi and Shirlie choked back the tears as they remembered their “beloved friend”, while Andrew Ridgeley said it “felt like the sky had fallen in”. “Music has magical power and George knew that,” said Helen ‘Pepsi’ De Macque. Chris Martin’s performance of A Different Corner was equally moving. And what a nice touch to include a clip of Prince – an artist who supported George throughout his battles with Sony – in the video montage during the song. 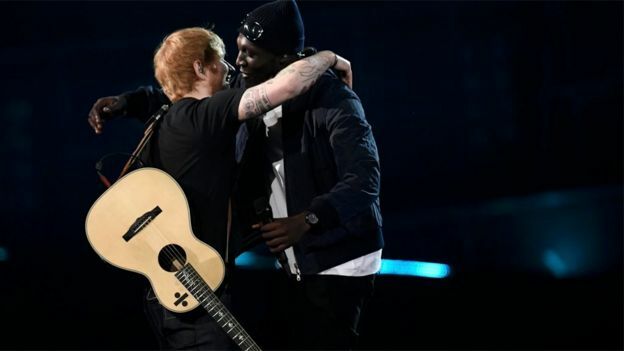 Ed Sheeran and Stormzy were the only act who managed to get the music industry executives up on their feet at the O2 Arena. The unlikely duo were premiering a remix of Ed’s Shape Of You – currently the UK’s number one single. After the performance, Ed announced the duet would get an official release this Friday. Bono-in-training Chris Martin jumped off the stage into a baying crowd of Brit School students during an ebullient performance of the new Chainsmokers / Coldplay collaboration Something Just Like This. Of course, the problem with stage diving in the smartphone era is everyone’s so busy trying to get a selfie that no-one bothers to catch you, as Chris soon discovered. 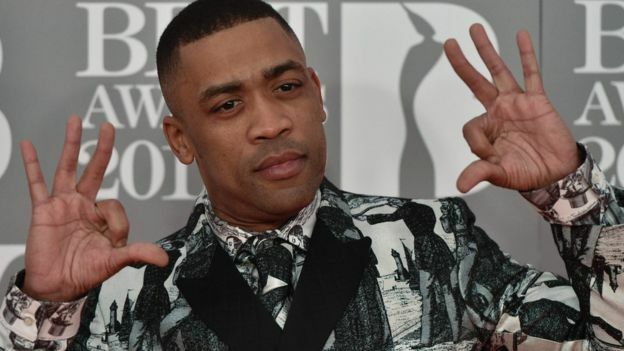 Wiley, the Godfather of Grime, was on cloud nine as he walked the Brits red carpet, happily chatting to anyone who crossed his path. The star was over the moon to see fellow grime stars Skepta, Kano and Stormzy nominated, but he was equally bowled over by all the pop acts – telling the BBC about Katy Perry’s work ethic (“she’s like bam, bam, bam; jet after jet after jet”) before declaring his devotion to Little Mix. “I love Little Mix… Little Mix are crazy. They’re sick. 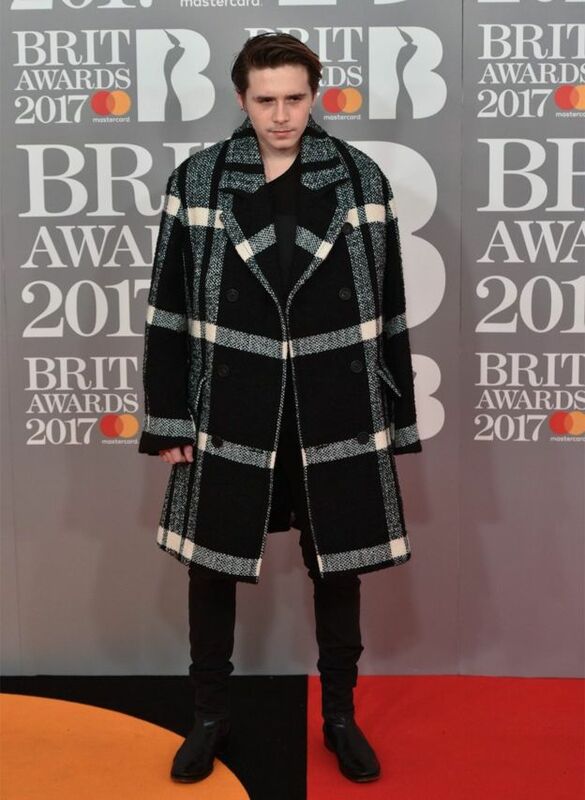 Brooklyn Beckham arrived with approximately 25% too much coat. The son of David and Victoria Beckham used the statement jacket to hide his sling after breaking his collarbone during a snowboarding holiday. 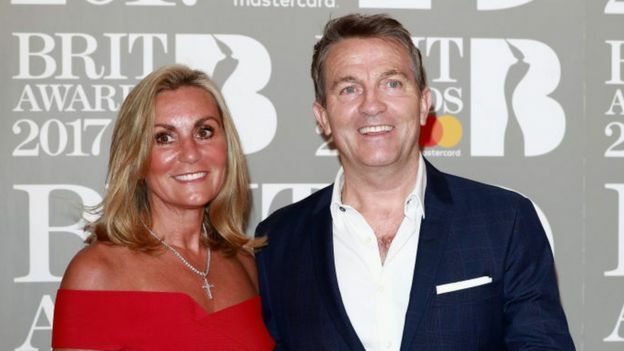 Bradley Walsh – yes, that Bradley Walsh, the one who hosts ITV gameshow The Chase – had last year’s biggest-selling debut album. Chasing Dreams, a collection of songbook classics, outsold the likes of Zayn Malik and Jack Garratt… begging the question, will there be a sequel? “I’m sitting on Sony Music’s table tonight, so I’m going to find out if I get a second album there,” he told the BBC. 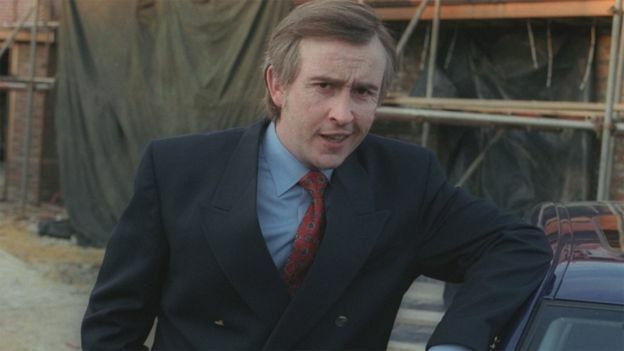 “They’re my bosses, so I’ve got to go and sit in there and make sure I eat with the right cutlery and all that stuff”. But fans of the star’s distinctly old-school tunes might be in for a surprise if Sony do greenlight that record. 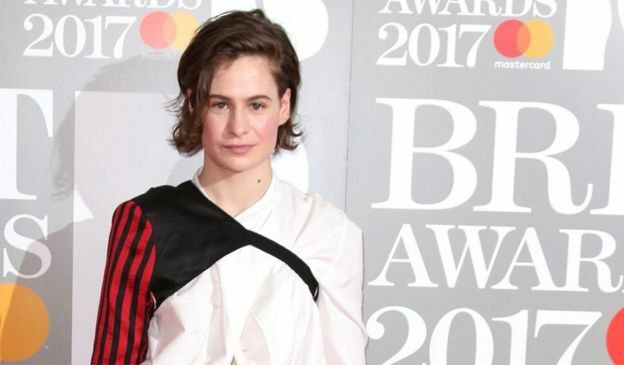 France’s Christine and the Queens – aka Heloise Letissier – had one of the breakout pop albums of last year, earning her a nomination in the best International female category alongside Rihanna and the two Knowles sisters, Beyonce and Solange. She (correctly) predicted she would lose to one of them. But she felt a familial bond with her fellow nominees. “I just bumped into Katy Perry,” Bastille’s Dan Smith told the BBC. “That’s not your everyday thing. I had to have a conversation with her. I was really awkward. Katy, if you’re reading this, here’s what he was on about. Brits 2017: The real winners and losers 0 out of 5 based on 0 ratings. 0 user reviews.